Anyway, back to Bali! 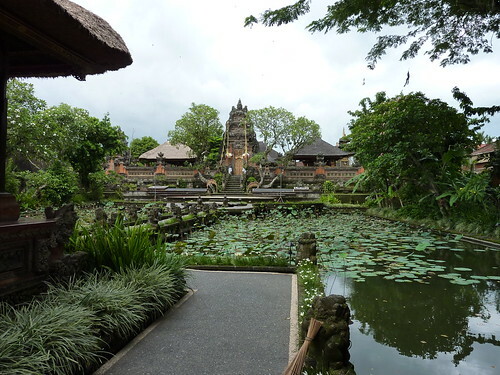 Beautiful, lush, green, hot, humid, tropical Bali. I love it! 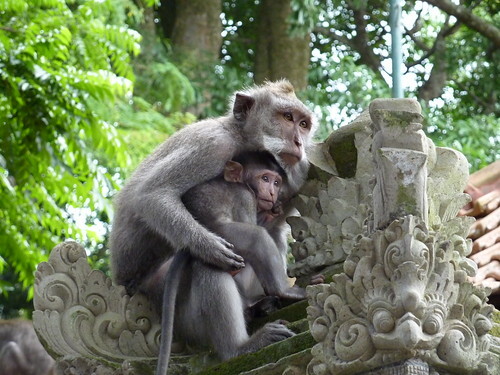 We arrived at midday and went straight off to explore Ubud and the monkey sanctuary. I’m pleased to say that I won a fight with the monkey that almost immediately tried to grab my water bottle but I will admit, flashbacks from watching Outbreak and 28 Days Later unnerved me slightly and I was a bit more cautious as we approached the hundreds that were running freely through the forest. After surviving the ‘sanctuary’ we wandered through the numerous art and crafts shops before heading back to our pre-booked (read: blown the budget for Christmas) guest house for a swim. This entry was posted on Thursday, December 24th, 2009 at 08:47 and is filed under Travel. You can follow any responses to this entry through the RSS 2.0 feed. You can leave a response, or trackback from your own site. Happy Christmas! We missed you here in Sevenoaks! Hope you had a good meal/massage – I’m sure we’ll read all about it sometime soon.